Stars, arrows and circles.....delicious.....& your Puppy!! Even more delicious!!!! Fave colour is blue, always blue!!! Love that circle cut file...perfect and all the arrows! Awesome layout Juliana! And my favourite colour has always been blue!!! Your backgrounds for so creative, love them all..... My favorite color is teal.. This is a really fun layout, Juliana ... I love the colour scheme and that cut file is soooo cool! Those wood accent pieces are perfect! All around, I love this page - thank you for the inspiration, not to mention a generous giveaway :) Have a fantastic weekend! I always love your layouts and this one is no exception! My favorite color is blue. makes your husband happy too! My fave color is PURPLE!! Love your layout. So effective in displaying your photos. My favorite color is teal. Beautiful layout, I love all the movement you were able to create with your product placement. My favorite color is Aqua. A fun layout… love the colors. My favorites are yellow and green… just love that they are happy colors! Aww..such a sweet layout, blog post and pictures! All came together so nicely! Love the circles with the stars. The papers that you added behind the picture really make the picture stand out. The orange kind of matches the orange of puppies ball. Forgot to tell you that blue is my favorite color. thanks for asking. Loving your layout and especially that stars in circles cut file!! ohhh LOVE your cut file and gorgeous colors!!! cool page!!! hmmm my fave color is aqua. My favorite color right now would be teal, it might be different in 5 minutes! Oh, your little pup is the cutest! What fun he must be. My favorite color right now is coral. I love wearing it and crafting with it!!! Thanks for the chance to win a mystery prize!! Lincoln is such a cute little "fluff ball"! Love the large cut files you use on your layouts - really makes the layout pop! Nothing like a sweet new puppy to bring on the smiles! As for favorite colors, mine right now is deep red....it's great as an accent or just by itself! 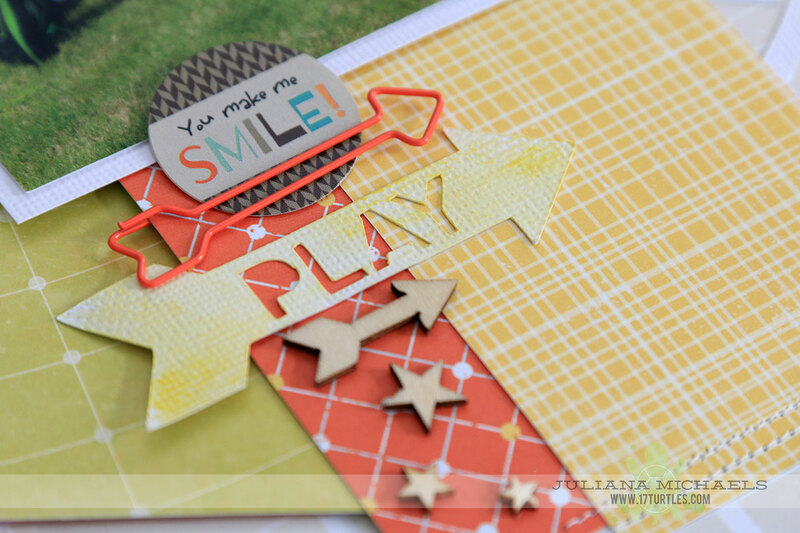 Beautiful layout Juliana! Lincoln is just TOO cute! My favorite color is blue - the ocean/sky color blue. I really like those circles with the stars that you used on your layout! So fun! I would love to win a mystery box of goodies, and my favorite color is blue or green! Thanks for the inspiration. I like that you kept it simple and the photo is the main point on the page. Also - such a nice handwriting. I adore this...I can't wait to give that file a try! And such an adorable photo! Beautiful layout, lots of really great details! I totally love this!!!! Such a great picture that you captured and the layout is just adorable!!! Hugs! I love everything about your page! The picture is the star, in so many ways - what a fun and super cute image and story about your hubby and fluffy little Lincoln! I love the journaling and you used my favorite color (yellow) on your layout! Thanks so much for sharing your project and for the chance to win something fun! Great page and love the photo! Your puppy is too cute!